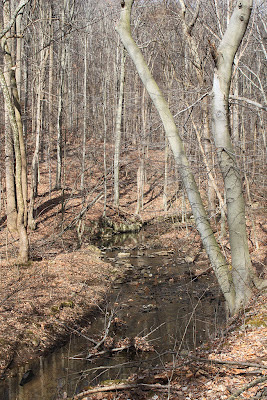 After I played in nature’s moss garden for a while, I headed further along the stream and deeper up the valley. Baby Dog liked this part of our walk much better. She never did figure out what I found so interesting about that moss. Sniffing every leaf on the ground was more her style. Although she doesn’t look like one, that girl seems to think she is a bloodhound. When I first started my walk on Sunday, I wasn’t sure I’d be able to walk through the entire valley. Since the ground isn’t frozen, I was afraid it might be muddy and sloppy, as it often is after spring rains, but the mud remained at a level that wasn’t unpleasant for me or for a dog who doesn’t like to get her toes wet, let alone muddy. The woods are still quiet, winter quiet. Every now and then I’d hear the pileated woodpeckers fussing and arguing in the distance. A red-tailed hawk screamed overhead. The jays were occasionally intrigued by our passing. Those sounds were occasional. Mostly it was quiet, and our footfalls made more noise than I heard throughout the forest. Baby Dog enjoys this walk, a change from our daily morning routine. It’s too dark and too far to walk this route during the mornings. Soon, too soon on such a beautiful day, we have walked the length of the valley and have reached the point where I must turn back up the mountain and return to the cabin. Our late winter walk has come to an end. First off, I can report that Baby Dog has no interest in mosses. So she couldn’t figure out why I kept stopping on “her” walk to look at them. I, however, think mosses are very neat things, even more so in winter when they aren’t competing with equally neat flowers and birds and bugs and such. The first photo is of cushion moss. It’s growing off the edge of a bank and reminds me of a water fall. My moss identification skills are pretty poor, partly because there are a lot of different mosses that are very similar, but mostly because good moss identification guides are tough to come by. 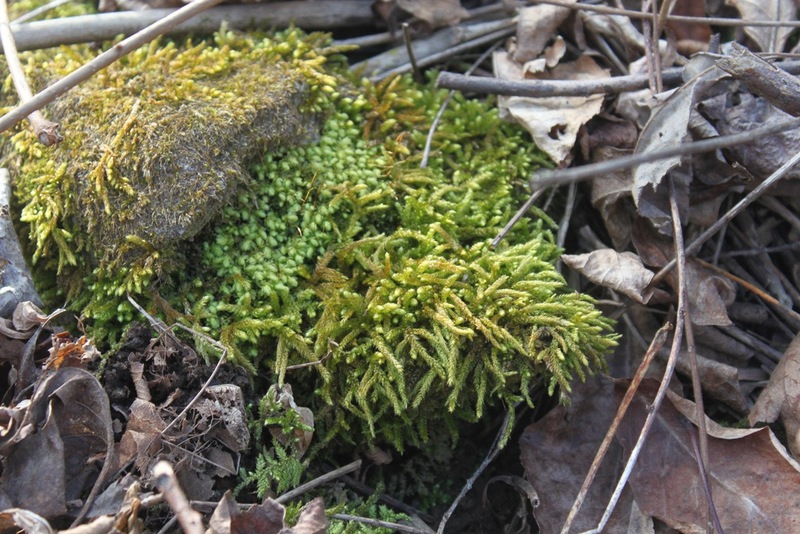 And moss species are quite variable even in small areas, unlike birds where a guide to the eastern U.S. covers everything you will see in that region. For a moss guide to be really accurate, you’d probably have to have several for the average state, either that or a really big book. 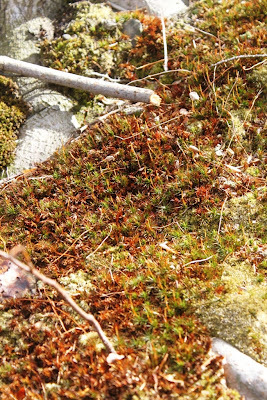 The next photo is of feather moss, I think. This is one of the identifications I’m not sure of. My photo looks close to that, anyway, so that’s what I’m calling it until someone else tells me something different. The last photo shows the moss spores. Now here’s where I think the mild winter is showing up in the landscape. 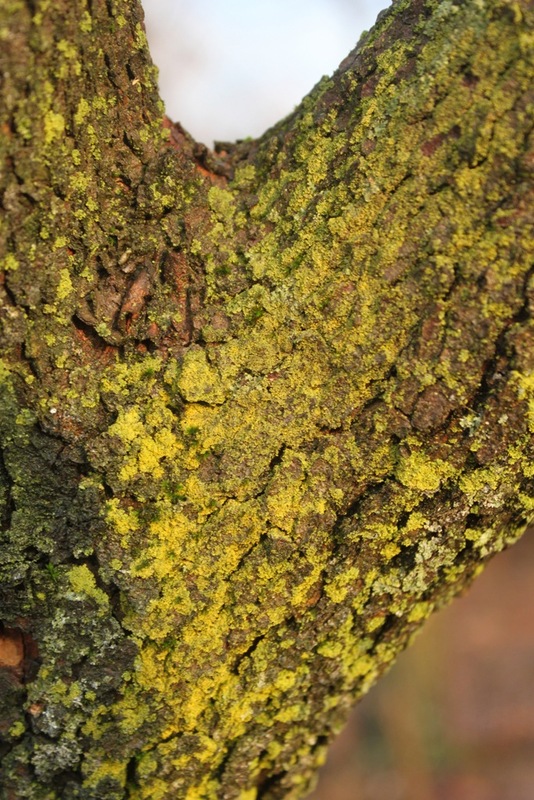 Moss spores typically arrive in late March or April. Here we are a few days before the end of February and those spores are out there and ready to go. I think this may be the first actual sign of spring and its early arrival that I’ve found. Spring arrives in the small things first, though I am usually too busy looking for the big things to notice them. 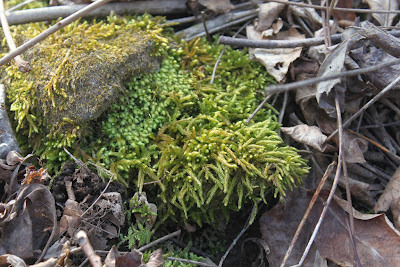 I’m looking for birds and wildflowers, but I guess I should be looking more at moss to tell me when spring is arriving. Sunday dawned sunny and calm, a blessed relief after the brutal winds of Saturday. 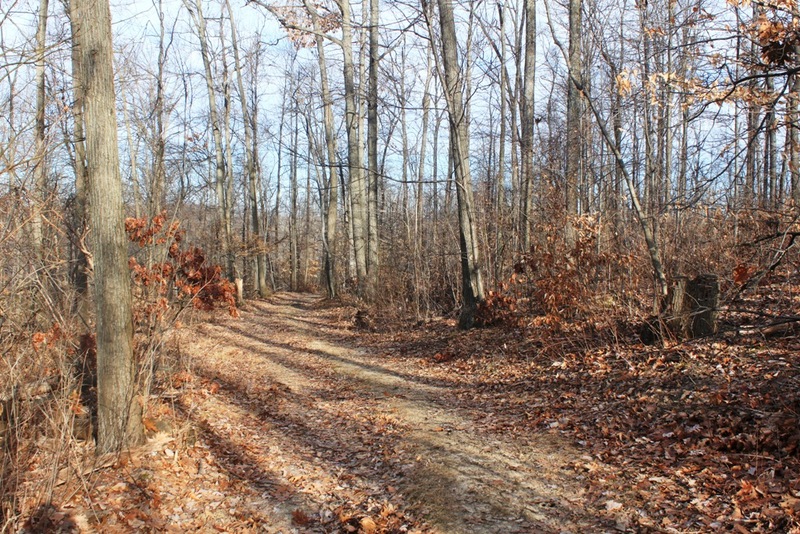 Time for a walk through the forest to see what late non-winter, early spring looks like. Baby Dog was my companion, a guinea pig for the new hands-free leash system I’d just gotten. With Baby Dog tied around my waist, I could carry both my hiking stick and my camera. The weather was seasonably chilly, especially during the pre-noon hours. I noticed only the sun and its increasing warmth, far warmer than the sun of just a month or so ago. 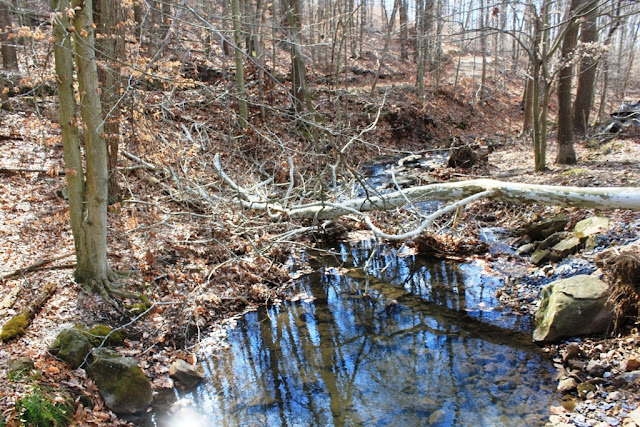 I wanted to see if the warm winter had sparked any signs of new spring growth, even though it is still very early. Baby Dog wanted to sniff her way from one end of the mountain to the other. It was a good mix. Looking across to Nell’s Hill, the vista looks as wintry as ever, considering there is no snow. The trees are still sleeping, and even the buds aren’t yet enlarged. Grasses are brown and flattened. 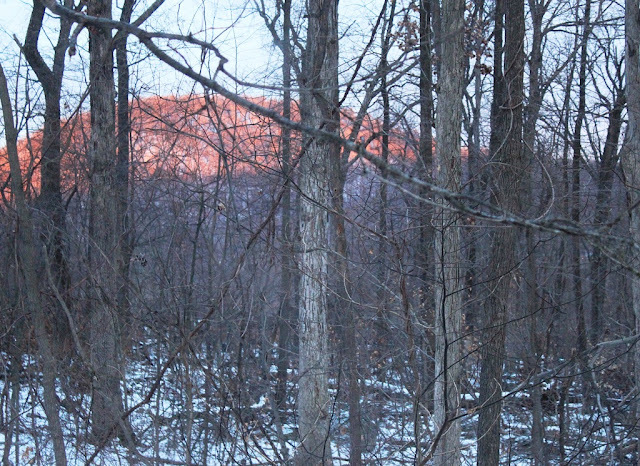 The landscape is largely silent, at least until three pileated woodpeckers got into a shouting match. I never could decide if they were alarming at me or were fighting among themselves. Three crow-sized black-and-white birds screaming through the forest are ear-splitting. We hadn’t gone very far before six deer tiptoed and then bounced along in front of us. They all looked brown and healthy. These deer had an easy time of it this winter, though they aren’t fat. I suspect that even during a mild winter a diet of dead, brown grass and the few acorns that fell last fall doesn’t have much nutritional value. At the bottom of the abandoned ski slope, we turned north and reached a pond, as always unfrozen. Water is pumped out of this pond for snowmaking, so the water never freezes. 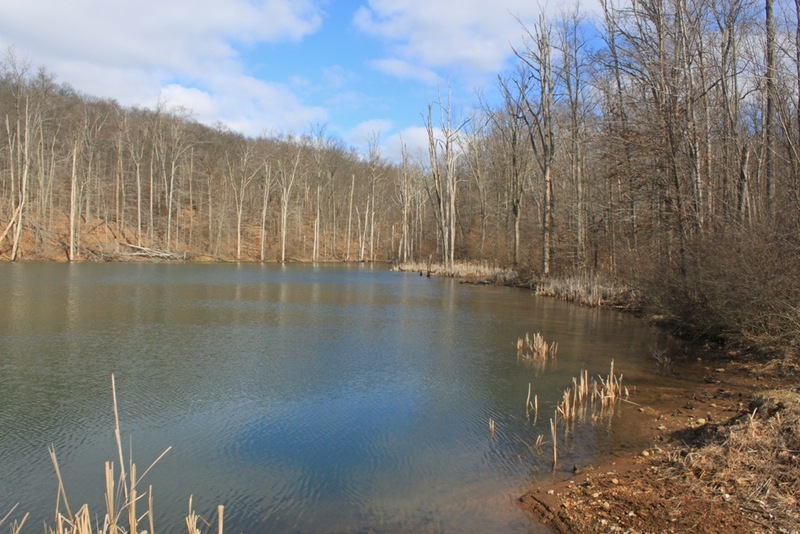 Even without that, the pond would be late freezing as it is both deep and spring-fed. In summer the edge of the pond is dense with cattails and other moisture-loving plants and is a great spot to watch butterflies that are attracted by thistle and the mud along the water’s edge. I look for skunk cabbage, among the earliest and arguably the largest of the new spring growth. I don’t see any. 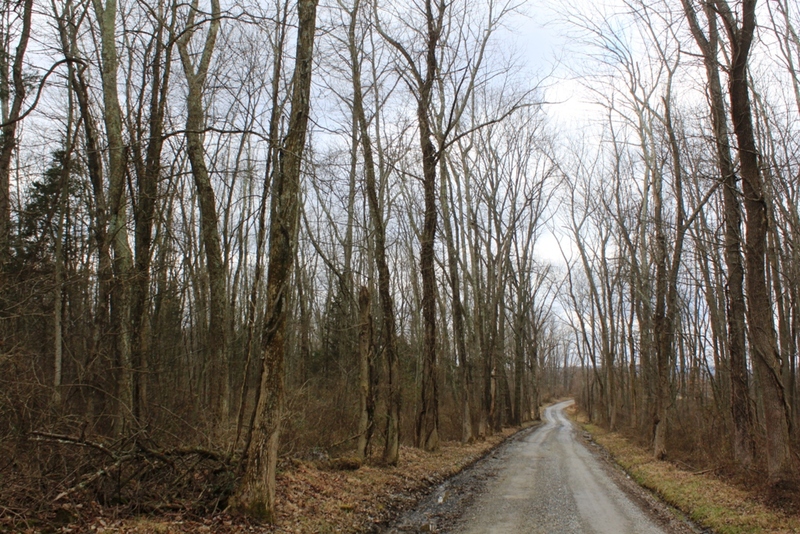 After the pond, we walk along an old woods road. I notice that I can see deeper into the forest than I’m used to. The lack of underbrush means I can better see the topography of the land, see rock outcroppings that I normally can’t, see a small draw across a creek that bears investigating on some future day. The stream that flows through the narrow valley is running and pretty full, if not as full as after spring rains. The ground is soft but not muddy. In April the area is often too wet for walking in hiking boots, and even with Wellies or rubber boots, the ground can be so mushy that I can easily sink 3-4 inches. I usually just avoid the area then, waiting for the drier weather that will come after. Baby Dog isn’t sure about the new leash. She wants to stop and sniff everything, and I want to keep walking. She’s like a kid in a candy store, and I’m not letting her buy any candy. We move deeper into the forest, her lagging behind as always. 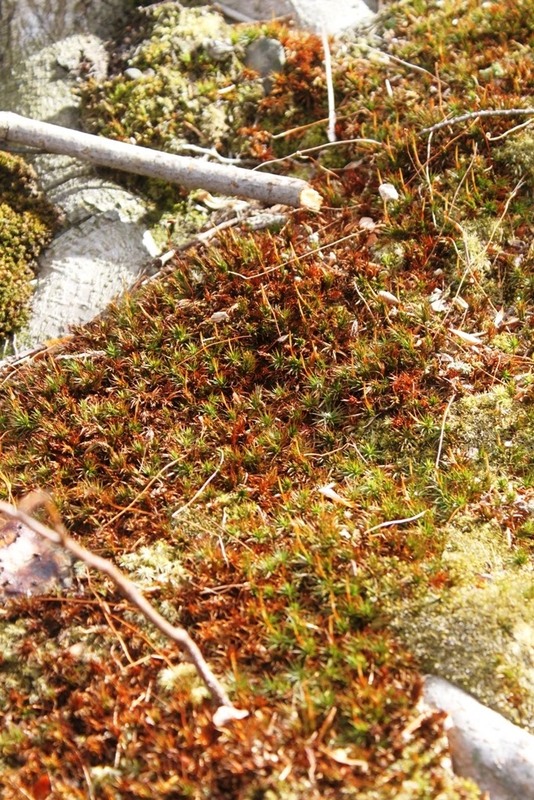 I reach an area where mosses are thick and lush, a haven of greenery in the brown. I’ll post photos from that part of our walk tomorrow. While it has always been true that nothing ever goes as planned and Murphy’s Law reigns supreme, I think both must be even more true in this technological age of ours. Things break. Our ancestors had the same problem, I’m sure, if on a different level. What do you do when a wheel to the horse wagon breaks? Well, if you’re in town it’s probably nothing more than an afternoon’s hassle, but if you’re between towns or out on the frontier somewhere, that accident can suddenly become life-threatening. Today we have more technology than ever, both appliances and electronics. We have tons of that stuff. When it works, it’s wonderful and time-saving. When it doesn’t, all that time-saving goes down the drain, and we spend time trying to get it fixed or getting a new one. Given the amount of technology we have, sometimes keeping everything in good repair feels like its own full-time job. Today it’s the USB cord that I use to download photos from my camera to the computer, which means I can take all the photos I want, but I currently have no way to get them out of the camera. I’ve ordered a new cord but until it arrives early next week I won’t be posting any new photos. Sometime this weekend I will likely dig out an old point and shoot camera that I haven’t used in years and see if I can make that work again temporarily. 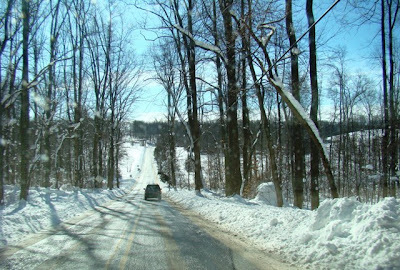 So in the meantime, I’m posting a few photos of what a winter should really look like, just so we don’t forget. With 60 degree weather in February, I almost expect to see leaves popping out at any second. Apparently, the leaves know better, as I see no evidence of popping. Even the grass is still brown and brittle. 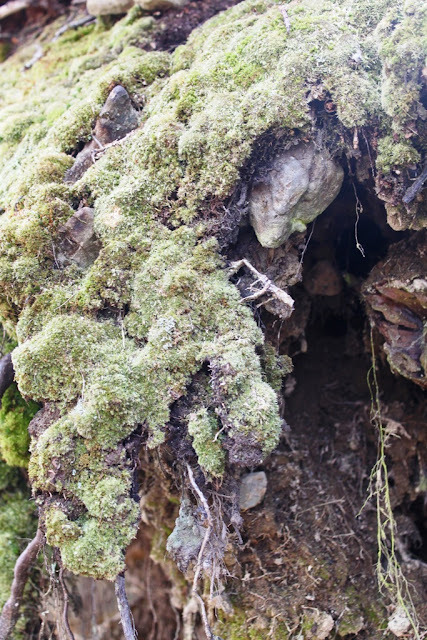 So the only green things around are the mosses and lichens, such as this moss-covered tree. The temperatures are so balmy that I have look up into the night sky, just to make sure the winter constellation Orion the Hunter is still there and not replaced by spring’s Leo the Lion. In a normal winter, I would be thinking that snow, even a big snow, is still possible in March. A March snow doesn’t usually last very long here, but this year, I don’t see much potential for a March snow. Even though long-range forecasts are notoriously wrong, the temperature forecasts aren’t even close to being able to produce snow. Winter is done. The only real question is how long will it take for spring to arrive? Every day I watch the sun rise earlier and set later. A minute here, a minute there and soon the difference is a large one. The sky is no longer pitch black when I get home. Before long, the chickens will still be awake (and will need attention) in the evenings. When I walk Dog in the mornings by the time we are through, I can see the barest hint of orange color in the east. Overhead, the stars are dimming and what was once a velvety black showcase for nature’s diamonds is now a steel blue. Canada geese call every morning from over on the new pond. They are raucous and I can tell they are chasing each other around, trying to find the best nest sites and chase off interlopers and upstarts. A great horned owl calls from somewhere distant, perhaps over on the next ridge. Not even the skunk cabbage is breaking through the ground just yet, but the first hint of green can’t be far off. The days are untypically warm for this time of year. The nights sometimes drop below freezing, sometimes well below freezing, but sometimes never make it below that mark at all. It’s that time of the year I should rename the time of many coats. I never know from morning to night which coat will be needed, the light jacket, the raincoat with lining, the heavier jacket I wear in all but the coldest weather. Sometimes I need all three on the same day. I still can’t smell the spring, though the ground is not frozen. Spring has its own pure smell. I think of it as a smell of new life and fresh earth. The earth is fresh on this late February morning, but I’m starting to think the germinating seeds know enough not to break out of their loamy beds and reach for the sun just yet. Perhaps next week. 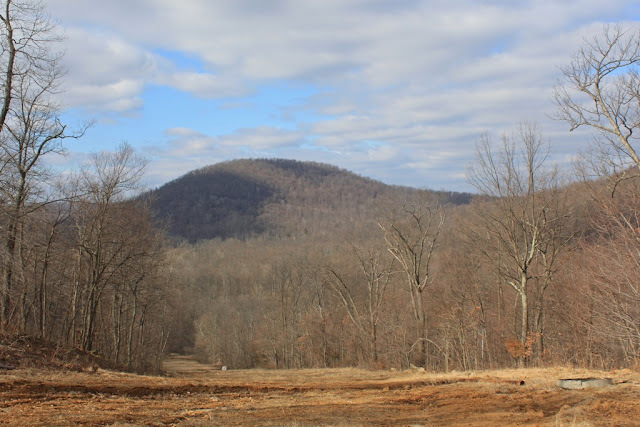 Roundtop Mtn. didn’t get any of the snow that fell further south this weekend. In fact, the weather, while not warm, still felt rather balmy as the wind was calm and the sun often appeared. During the late afternoons, temperatures were in the mid-40’s, and when I was out and about I still saw a lot of people sitting on their porches and enjoying the mild weather. I saw a few in t-shirts, but I think that might have been taking things a bit far. Up on the mountain I ran all my outside chores without a coat, though I don’t think I would have wanted to sit outside without at least a light jacket. 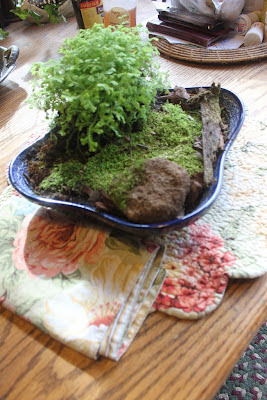 One thing I accomplished this past weekend was to create small moss garden that will sit on my kitchen table. Over the past week or so I started gathering a few things to include in it. And I finally found the small stone with moss on it that I was seeking. The rock is not as thoroughly covered with moss as I would like, but it’s close enough. I found a couple different kinds of moss and a stick with moss on it. I bought the large clump of moss you can see in the far corner, but the other mosses were found on the mountain. 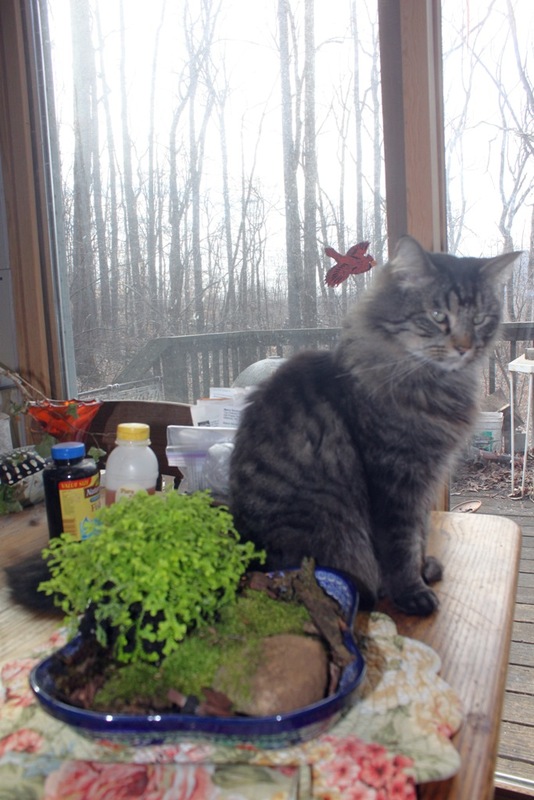 The first photo is not the best, but Ben the cat wanted his photo taken with the moss garden, so I was forced to oblige him. At this point in the so-called winter season, I doubt winter will bother to arrive at all. That said, I haven’t yet found any actual signs of spring in the landscape or in the birds, but that can’t be far away. Cardinals, song sparrows and bluebirds are singing, but those all sing even in a snowy February, so they don’t count. Nighttime temperatures fall into the mid or upper 20’s, but every day works its way above freezing before noontime. 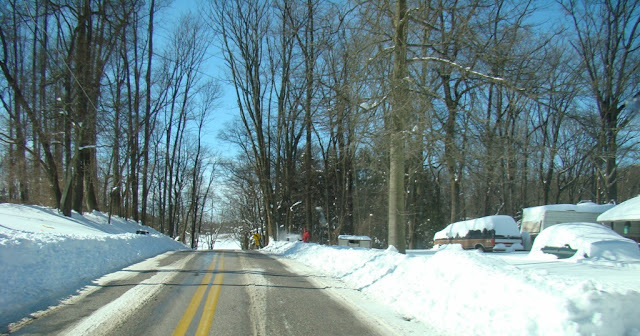 This freeze-thaw pattern, bad enough in a normal winter, is likely going to create some mythic potholes around the area, certainly enough to keep the local road crews busy for much of the spring. With such a mild winter, I’m wondering and worrying about the upcoming bug season. Fleas, ticks, stink bugs, mosquitos and who knows what else are likely to be in greater numbers as there’s barely been a hard frost and virtually no snow cover or frozen ground. I can’t say I’m looking forward to any of that, though as long as winter isn’t going to bother arriving, I’m starting to wish we might as well get on with spring. I’m starting to believe even this non-winter is coming to an end, though other than one fleeing skunk, I’ve yet to see any real or actual signs of spring just yet. Well, other than rain when it should be snowing, but that’s how this whole non-winter has been so that doesn’t count. What I’m looking for and have yet to find are signs of new spring growth, and that is not yet making an appearance on Roundtop Mtn. This long, long November is still holding on, though who knows for how much longer? While I’m not seeing obvious signs of spring, it’s starting to feel like spring to me, though I can’t say precisely how or why. Perhaps it’s the longer hours of daylight. Perhaps it’s the soft ground. Grass is still as brown and flat as you could want, and it doesn’t yet smell like spring. And yet there’s something that suggests to me that spring is just about here, perhaps only a mile or so away, or maybe just behind the eastern ridge. My moss garden is coming along, and I hope to finish it sometime this weekend. I’m still looking for that perfect moss-covered rock as one of its features. I have found some lovely ones that are unfortunately too large for the small arrangement I’m working on. I know where some right-sized mossy rocks are, but I’ve so far avoided going there because I know the area will be a mushy, wet mess. If nothing else turns up, though, I’ll just put on my Wellies and head down there. I suspect the long non-winter is about over, presumably to be replaced with an early spring. This morning Dog found a beautiful and large skunk, and no, I don’t have any stinking stories to report. Fortunately. Skunks aren’t true hibernators, but they do den up for the winter. The fact that this one was out and about tells me he or she is done with all that for this season. We encountered the skunk, only the third one I’ve actually seen on the mountain, around 6 a.m., when I still needed my headlamp. We were walking through ski resort’s dirt parking lot, along the edge of the woods. Dog was on a long lead, ranging a bit ahead and over to one side. The skunk quickly scurried away from us. Dog tried to give chase, but encountered the far end of the long lead before he encountered the skunk. Fortunately for us all. I guess it was two years ago that Dog met up with a baby skunk and got close enough for a passing spray. He didn’t take a full shot by any means, but he still spent a week sleeping out on the back deck. Tomato juice baths helped, but not enough to have him in the cabin. Fortunately for him the weather was warm enough then that this was no hardship. After a week the weather turned stormy, and I brought him inside again. I could still get a whiff of that that skunk in damp weather for at least another week after that. But back to today’s skunk. It’s out. It’s about. So even this non-winter must be at an end. Unfortunately. I find I am growing restive during this never-ending November that is trying to fill in for the missing months of winter. Poor November, stuck here for weeks, with no relief in sight, no sign of December, January and February anywhere. Who knows where they’ve gone? The only thing November is sure of is that she can’t leave until some new month, any new month, shows up and lets her off the hook to take a much-needed break. November is tired of being here. I’m tired of entertaining that same old month. November has been here so long, I should start charging rent. Months should only last 30 days or 31 at the outside. November is closing in on 100 days now with no sign of picking up her bags and leaving. And it’s not poor November’s fault either. She was ready to go, she wanted to go after her allotted 30 days. It’s just that her co-months, her month-partners, never showed up. They’ve left her hanging, waiting at the bus stop for the entire winter. November is angry about that but can’t even chew out those unfeeling, unthinking months of December, January and February because she can’t find them anywhere. Sometimes November worries that something really nasty has happened to her co-months. She just doesn’t know what that could be. Other times, she is so angry with those missing months that she almost can pass for December or February. November is ready to strangle them all. She suspects the fault lies with January, somehow. January has always been a tough month, with little regard for the other months. Sometimes January has a lot of influence on December and February, too much influence, November thinks. At this point, November is hoping that March will arrive and relieve her suffering, but she doesn’t know how to contact March. March probably doesn’t even know that anything strange is going on. And so November waits, still here, still waiting for another month to show up and let her go on a long, and much-needed, vacation. 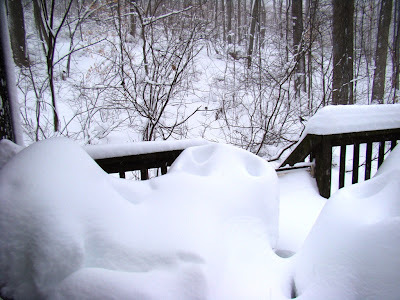 I expect it is more likely that I will run out of snow before I run out of snow photos to post. I’ve taken a lot of photos during the little snows that fell this past week. With warming on the way (after a brutally windy and cold weekend), an inch here and another there won’t last very long. The cold I don’t mind, but regular readers know how I feel about wind. It’s a rare weekend when I don’t take at least a short hike somewhere around the mountain. This weekend was one of those. Between the ice and the wind, I was content not to venture out very much. So I spent a lot of time inside the cabin, from where I could easily watch the feeder birds. For once this winter, I had a good turnout at my smorgasbord. No unusual species have partaken, but the two starlings trying to hang onto a tube feeder may be a first. Perhaps they were summer birds, taken aback at this unanticipated turn in the weather. Deer were well hidden this weekend, likely hunkered down someplace protected from the wind. The only evidence of their presence was a double set of tracks walking down the length of the lane in front of the cabin. Before the snow, I gathered some moss with a plan of making an indoor moss garden to brighten the winter browns. I’m not sure it will work taken this time of year. Normally, late fall, before the weather turns really nasty is a good time for that. The “garden,” is still a work in progress. More progress won’t result until the snow melts and the temperature warms at least a bit. Later this week should be fine. I’ll let you know how it goes. 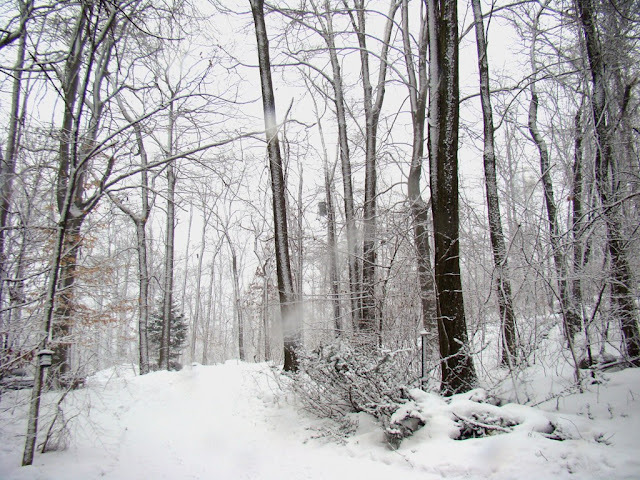 Yesterday brought a pretty little snow to Roundtop Mtn. and the surrounding hills. 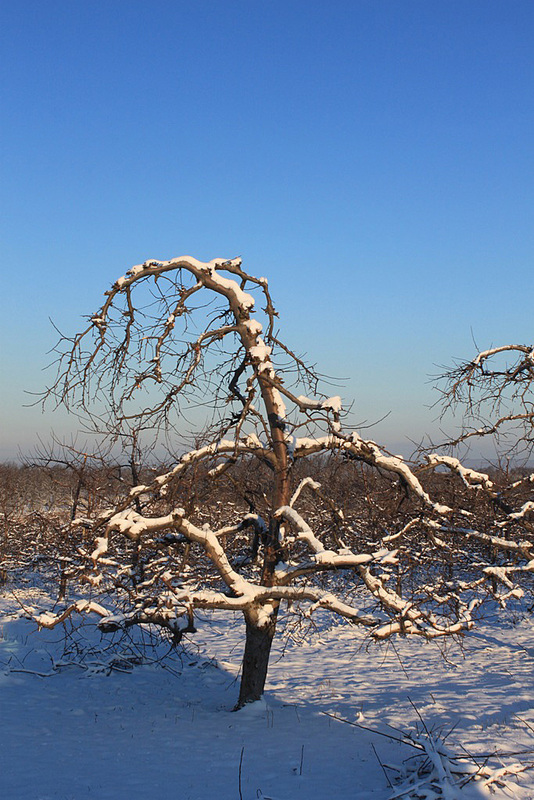 The snow was the sticky kind that sticks to every tree and twig, turning the entire landscape white. 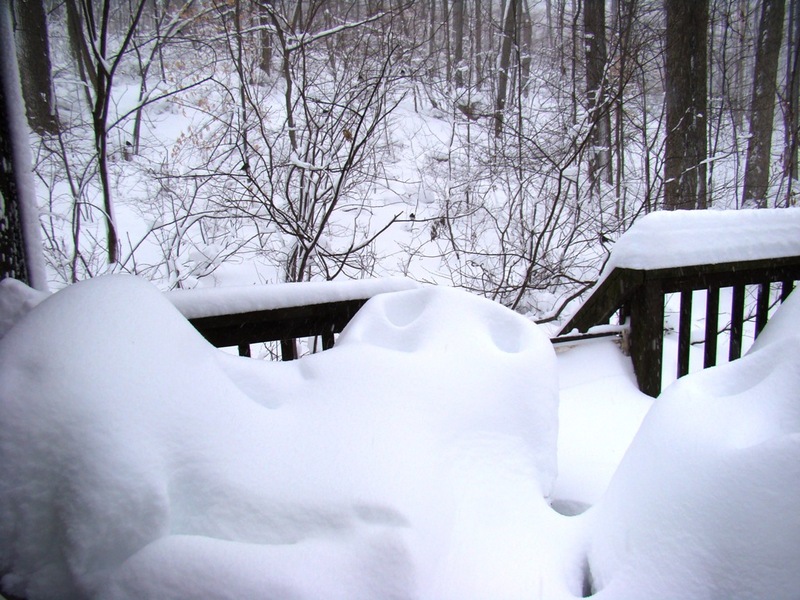 At the cabin, the snow was close to 3 inches but soon started to compress. Off the mountain, the area had about an inch. That brings the grand total for the winter season just under 6 inches of snow, far less than a normal winter. That doesn’t count “Snowtober” when 10-12 inches fell in the off season. 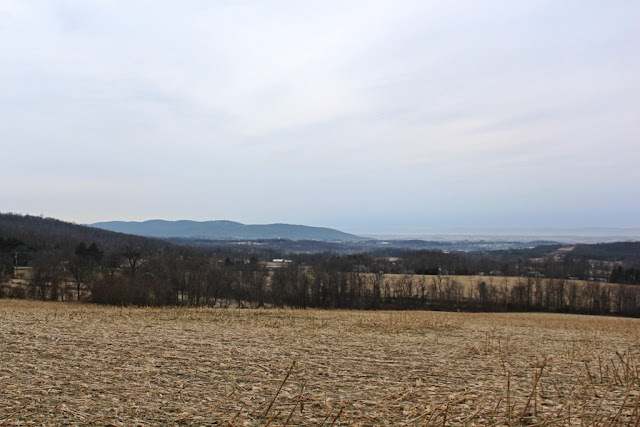 Normally, this area sees about a yard of snow each winter, with many winters running between 40-50 inches of snow. Most winters with less than average snows are still cold, and those years have tended to be drier ones; it’s not usually a matter or replacing snow with rain. This winter both snow and cold are lacking, and the precipitation has mostly been as rain. Not yesterday. For a little while at least snow fell and made everything look like winter. 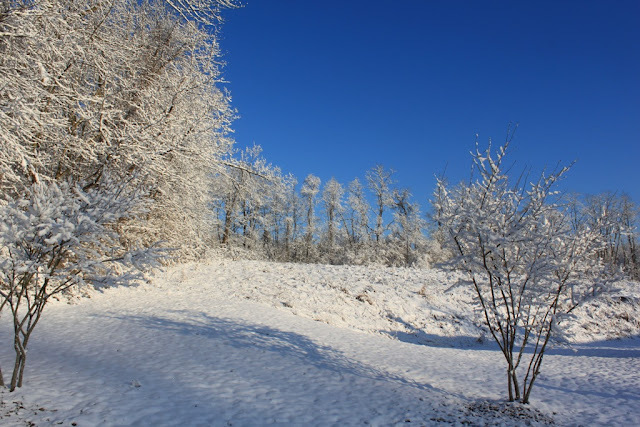 This morning, the sky was sapphire blue and perfectly clear. This little snow won’t last very long. The daytime temperatures will melt it quickly. But this morning was gorgeous and teased me with a taste of what a winter should always look like. That’s not just any old grey sky in this morning’s photo. Them’s snow clouds! And indeed, snow is starting to fall even as I type. Now the forecast is for only an inch or two, but this winter that is cause for celebration, at least by me. The temperature is only just cold enough to snow, at 31 degrees this a.m. Even that feels a bit like a victory, since on so many days the days are well above freezing and the nights only cold enough to flirt with that mark. 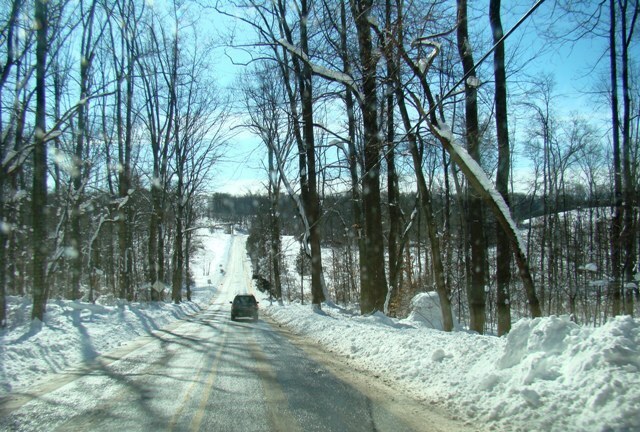 For a day or so, until the next warm-up, the landscape will look like winter again. Even the long range forecasts show little hope of an actual winter making much of an appearance in the near term. And each week that passes makes the prospect of spring more likely than much winter weather. Even the birds seem unimpressed by the prospect of a little snow. I have found them the best prognosticators of poor weather. When a bad storm is coming, they feed like crazy. It’s like a shark’s feeding frenzy only with feathers. Whatever sensors they use to predict weather, they are always right. Last night and even this morning, they didn’t rush to the feeders, weren’t pecking on the patio door this morning, demanding seed and suet. Still, I made sure the feeders were full. They may change their little minds once the flakes are a little thicker. The instant I stepped outside this morning to feed the chickens, I was greeted by the scream of a pileated woodpecker, warning all around of my appearance. A few steps later and I heard the twitters of the Eastern bluebirds, coming from the area of their hollow roost tree. It’s now light enough in the morning for me to see or hear a few birds other than the crows. The crows are still about, sitting atop a utility pole like a referee, warily eyeing everything around them, just waiting to call “foul!” on something, anything they don’t like, which is really almost everything. Here it is but a few days past midwinter and the difference from just last week is already noticeable. Winter can stay as long as she likes, as long as I can have the extra daylight of February to play in. Tomorrow might even bring snow. In a normal year a forecasted inch would not be worth mentioning, but this year is not a normal year. It’s the warmest and least wintery winter I can remember in what is now more than half a century (gack! How did that happen!) of remembering winters. Yesterday morning the nearly full moon was the color of an old gold coin, rich and almost bronze. This morning the moon was a cold, bone white, with not a hint of yesterday’s rich shades. And in the east, the first weak hint of dawn’s color, instead of the black sky of winter’s night. 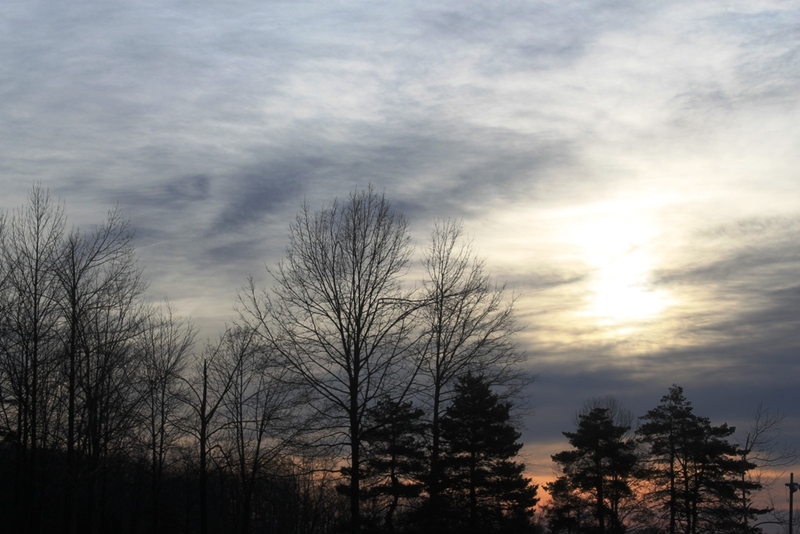 This morning the sky shows no hint of impending snow, as the morning is as clear and bright as you’d like. I hope the weather forecaster has it right for once. Flat light and overcast skies in the never-ending November that passes for the 2012 winter does not make for interesting photos. I decided to go birding instead and didn't find much. Nor did I find much last weekend, and it got me to thinking about why that might be. 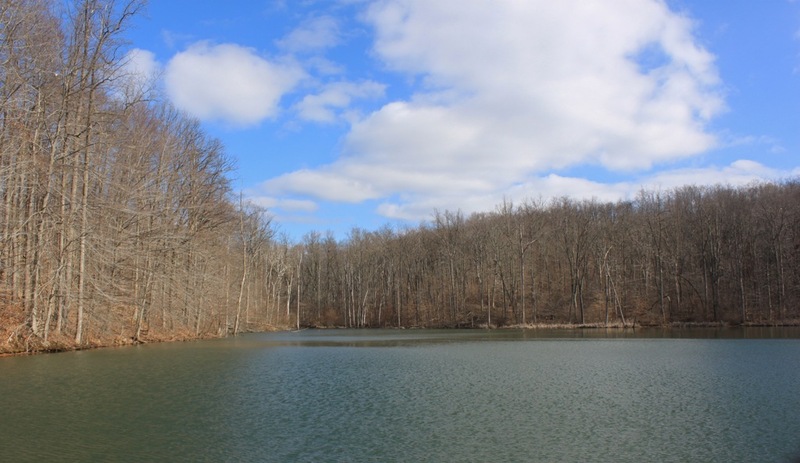 In a normal winter, the ponds and lakes are mostly all frozen over. 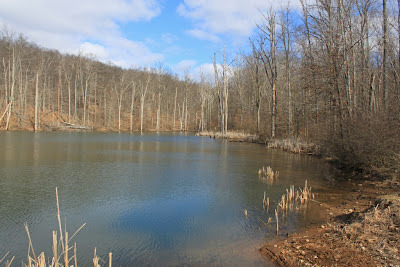 Over the years, I've found a few spring-fed ponds that stay usually stay open for at least the majority of the winter. 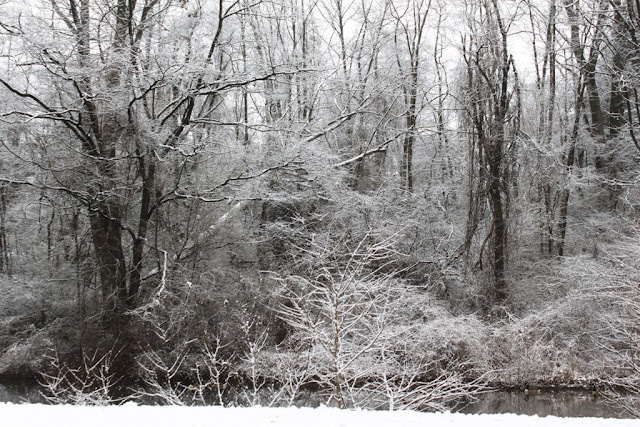 The Susquehanna River often freezes, too, though a few channels and other spots sometimes don't. 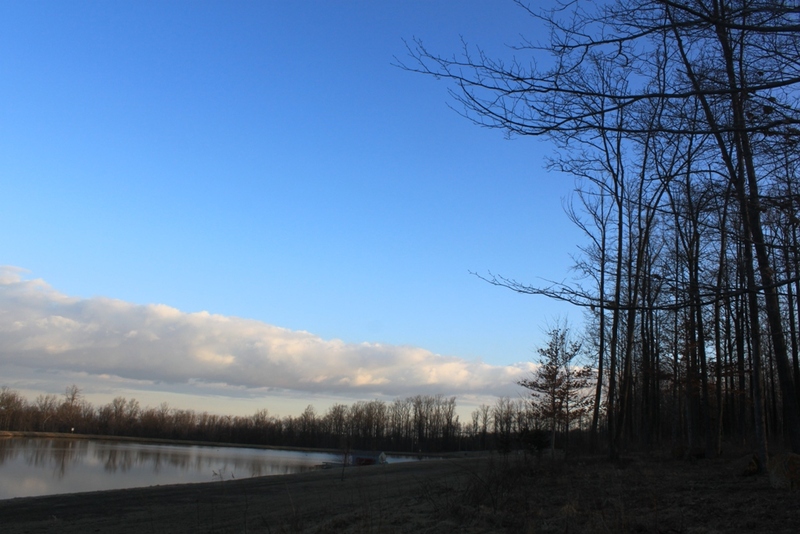 Wintering waterfowl congregates on those spring-fed ponds and open sections of the river. 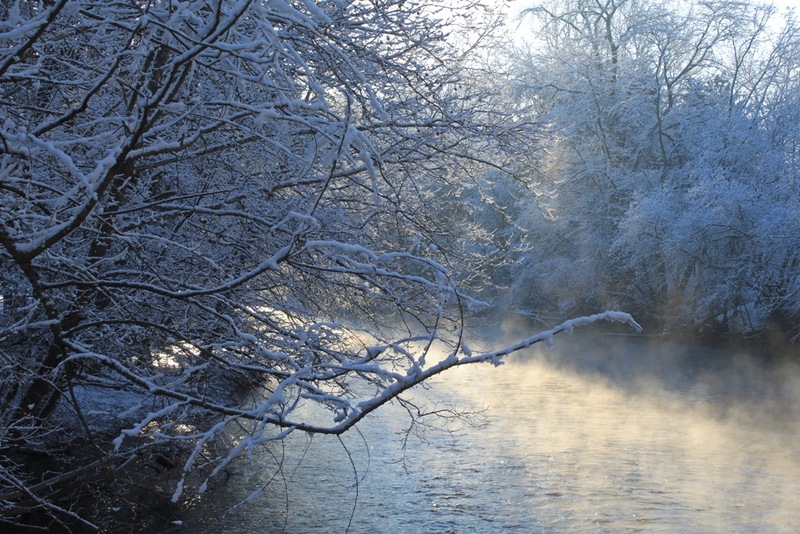 This year, all the ponds, streams, lakes and rivers are entirely ice-free. And guess what? I couldn't find a duck anywhere. So what's going on? First off, there's simply no need for waterfowl to congregate this year. They can go wherever they want to and find open water. The normal hot spots aren't the only game in town this year. 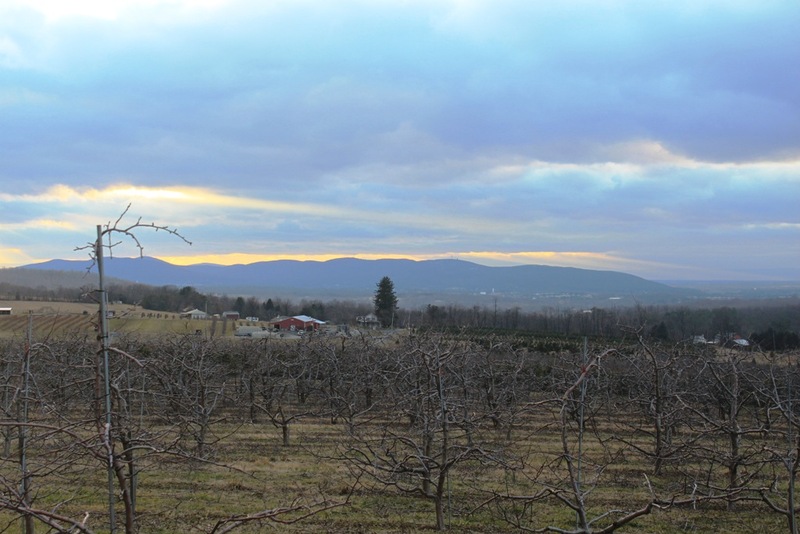 ﻿I seem to be wordless today, so I'll leave you with a near sunset photo looking over the valley. Happy weekend to all. I found this really cool shelf fungus on one of my wanderings this week. I imagine someone else removed it from its host tree and then left it. I suppose it’s possible it fell off on its own, as a couple of nearby trees could have served as a host, though I suspect not. 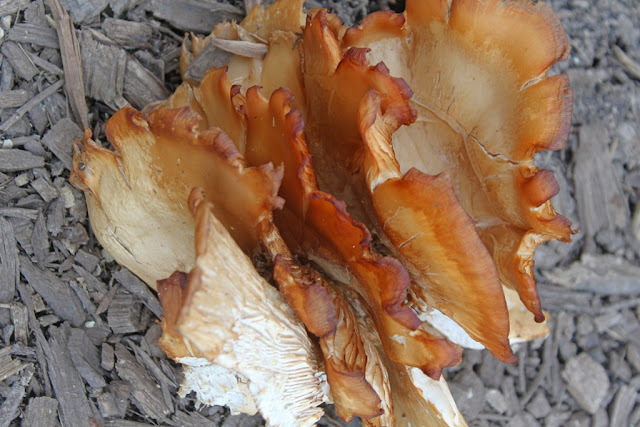 Fungi tend to hold on pretty tight and can damage a living tree. It’s even possible the fungus was deliberately removed it to try and save the host tree from further damage. Or, it might have been on a tree cut for firewood. It’s impossible to say. I think fungi are always fun to look at. They are easier to see in winter because they aren’t hidden by greenery and summer growth. And in a dull brown winter like this one, something that is bright orange is always a treat. This one was a good 7-8 inches long and 4-5 inches wide. It looked fresh, too. Shelf fungus are common here (and probably elsewhere, too) but this one was larger than most. The forest is quiet, as quiet, I think, as if the trees were blanketed in snow. I took a walk on a familiar trail during the early morning just to see what I could see. Even the sound of the ubiquitous blue jays was distant. The wind wasn’t stirring, and the forest felt as though it was dozing. I tried not to make any sound as I walked along the old path. Sometimes, despite my best efforts, my boot found a twig and cracked it. Even that sound didn’t alarm the residents. If they heard me, they gave no sign. The woods might as well have been deserted. After a while, I went off the path and walked through the woods. I can’t do that in summer when the underbrush and annual plants are growing. So winter is the time when I walk where there is no trail. After a while, I came across an old stone fence. It means that at one time these woods, where trees are now 120-150 years old, was once a field. Stone fences were created when the original farmers cut down the trees and cleared the land. 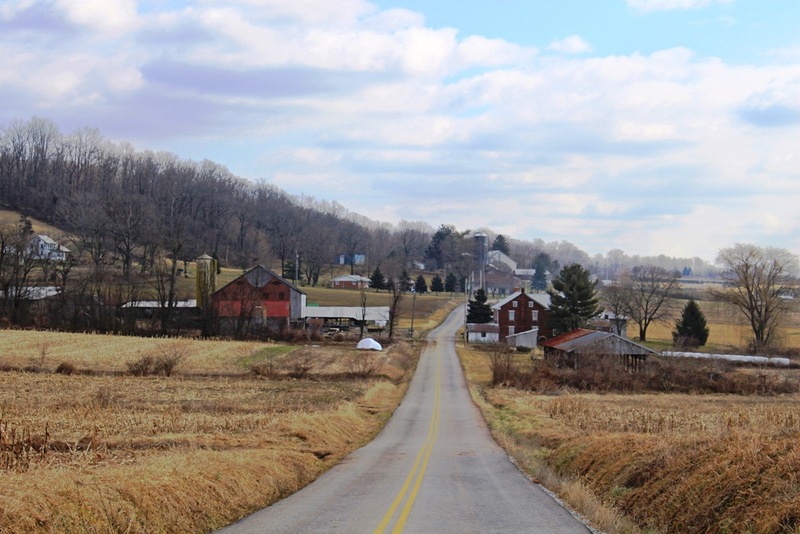 This area of Pennsylvania is very rocky, and those farmers had to put the rocks somewhere. Usually, they didn’t want to put them very far from the cleared land. That was too much work. So they built stone fences along their property lines or to mark off a field or a pasture. 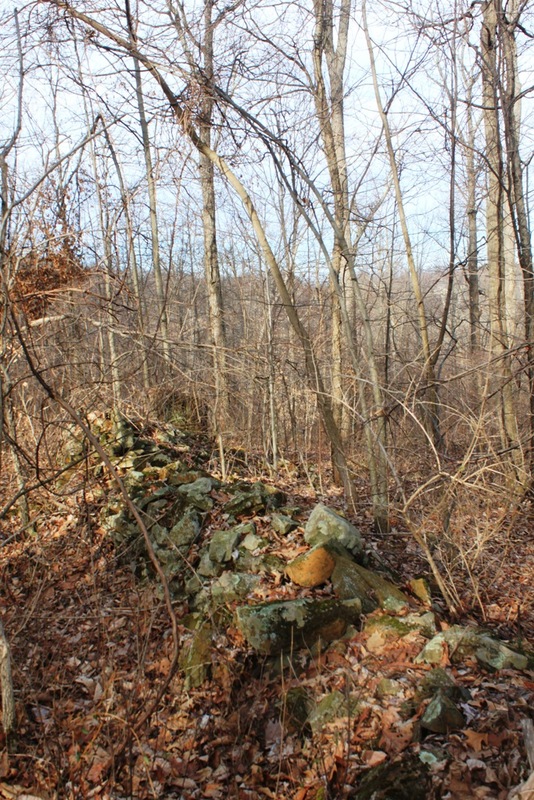 I know of two nearby ruins that were once foundations of either barn or house. This fence is far enough away from both that I’m guessing it marked the far end of a field. The fence is built on sloping land. It’s hard to imagine this spot was ever good for crops. It’s nearly as hard to picture these forested hills as cleared land. But cleared they were and now the forest has reclaimed its own, taken back what was once taken away. But for how long? I always wonder how long any of the forests around me will remain. Construction and building, houses and developments move ever closer, grow ever larger, year by year. We are too greedy, we humans. We always want more and bigger. We grow ever more populous. The next time these forests are taken, they may never be able to take back their own again. 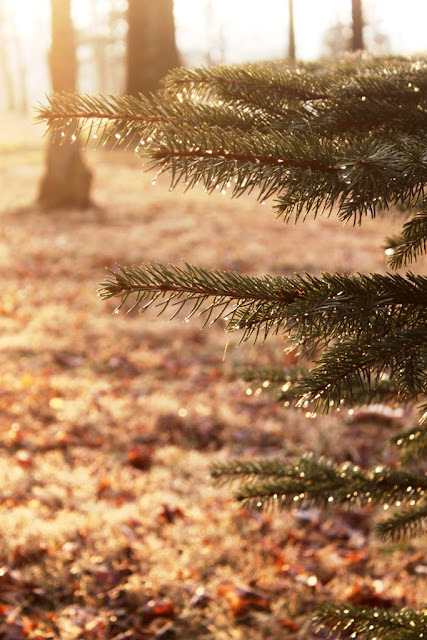 Nothing that humans build is as beautiful as a forest, not even one that is dozing through a snowless winter.